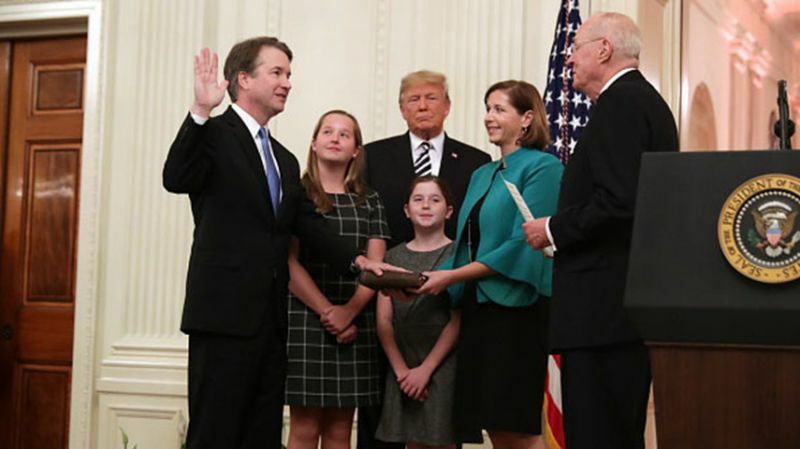 At the swearing in of Justice Brett Kavanaugh to the Supreme Court, President Trump praised his nominee "under historic scrutiny, were proven innocent"
VietPress USA (Oct. 8, 2018): Today on Monday, Oct. 8th, 2018 in the East Room of the White House, President Trump presided the ceremony of swearing in of new Justice Brett Kavanaugh to the US Supreme Court. President Donald Trump used this ceremonial swearing in of Justice Brett Kavanaugh to apologize for the "pain and suffering" that he and his family had endured during his Senate confirmation. "You, sir, under historic scrutiny, were proven innocent," Trump said during an East Room ceremony honoring Kavanaugh. Without directly mentioning the allegations of sexual assault that stalled Kavanaugh's confirmation for weeks, Trump said he thought his second nominee to the Supreme Court deserved better than the "campaign of political and personal" attacks that Kavanaugh faced. Having endured a trial by fire for three months as Trump's very controversial nominee, the 53-year-old Supreme Court justice won't have as much trouble blending in to what he has termed the "team of nine" Tuesday morning. Kavanaugh will be on the bench for the second week of the court's 2018 term, having missed six oral arguments. His appearance follows a whirlwind weekend in which he was confirmed by the Senate, sworn in, hired law clerks and assembled his high court chambers. After a bruising confirmation battle, partisan tension remains the order of the day in Washington. With a rebuke that is sure to be reprised ahead of November’s midterm elections, President Trump once again scolded Senate Democrats as he presided over a ceremonial swearing in of Brett Kavanaugh as the newest justice of the United States Supreme Court in the East Room of the White House on Monday. Kavanaugh’s actual swearing in was on Saturday night, shortly after he was confirmed by the Senate. In fact, an investigation like that performed by the FBI last week — lasting just five days and involving nine interviews — did not prove innocence. The FBI simply failed to find corroboration for the allegations against Kavanaugh. Christine Blasey Ford’s testimony before the Senate Judiciary Committee divided the nation. She and two other women accused Kavanaugh of sexual assault, but the president avoided mentioning their names and accusations during Monday’s ceremony. As he did in a striking op-ed published in the Wall Street Journal last week, Kavanaugh portrayed himself as a judge who would not harbor resentment of the process he had just endured. “I was not appointed to serve one party or one interest, but to serve one nation,” Kavanaugh said.